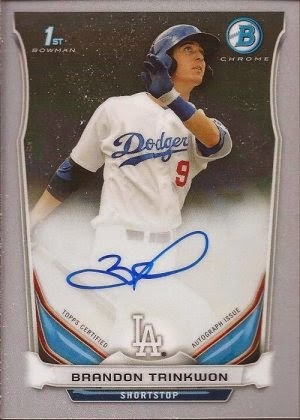 As everyone knows, and took part in, Brian from Play At The Plate gave away a box of 2014 Bowman for his blog's anniversary. Somehow, I ended up in the top spot when the randomizer finished. I had a really rough Saturday working on the car when the package came. It's only fair I record the rip so you all can see. If you look thru the chair slates behind the packs, you can see my dog with a face that would probably match my wife's. I didn't get my Abreu auto. It was a fun rip, and with the few pack I have bought, I am close to the whole set, so that's good. Here's a few scans on what I did hit. 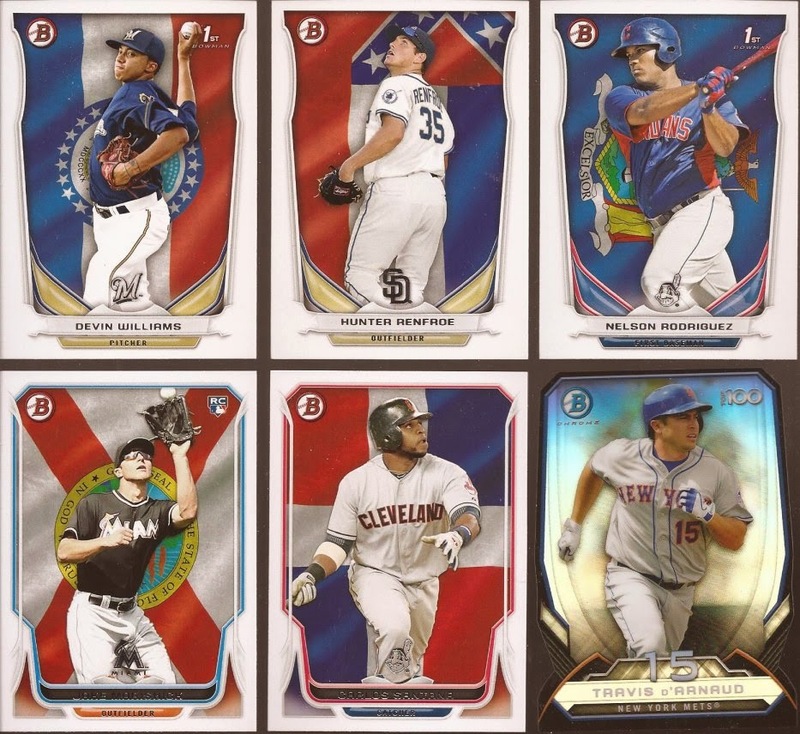 I pulled 5 of the flag backgrounds (none Illinois) and there is that diecut of d'Arnaud. Some of the colored borders. Yeah, I didn't scan the blue Chrome of Thorpe or any of the minis. If you are going to ask for those to trade, I can get you a scan if you want to see them closer. Here's my guaranteed hit. No clue who Trinkwon is. Baseball Reference has him as a recent drafted into the Dodger organization, so who knows if he will ht the bigs. I have dupes, and almost anything if available for trade. You know the drill. I'd love to trade for that Red Wave Payano if you still have it. Let me know on any Cardinals you pulled. Thanks! I also need your address to get out a long overdue PWE. One Card Post - Rink Rat! Baseball Cards Come to Life! Am I the Only One Worried When Kenley Jansen Pitches? I bought a collection of 561 different Paul Goldschmidt cards. Glavine's Hand - That's a first ! It's and there's still pack searchers at Target. Shutting Her Down, BUT WAIT! So, yeah, this is happening. Please Continue To Check This Blog Out! Christmas Gifts from William & Frankie! will there be a final tribute? Come on Guys and Gals ! You Really Disappointed me ! Baltimore Ravens: Who Has The Most To Prove In 2015? 3 Walk-Off Wins in 3 Days? Are You Kidding ME???? Griffey Jr Card Arrived From Topps! the long and winding road.